Cactus & Succulent Society of New Mexico is an affiliate of the Cactus and Succulent Society of America. Meeting Info: Albuquerque Garden Center, 10120 Lomas Blvd NE, Albuquerque, NM, 3rd Friday, 7:00 pm. Saturday & Sunday, April 13 & 14, 2019 - Spring Show and Sale at the Albuquerque Garden Center from 10am to 4 pm both days. More information about the Show & Sale may be found on the club information page particularly the "press release". July 17-20 - Cactus & Succulent Society of America Convention in San Luis Obispo, CA. More information is available at the CSSA site. August 31 - September 1, 2019 - Cactus & Succulent Show at the Albuquerque Botanic Garden. Pictures from previous shows are in picture galleries. Plant information may be found here. Checkout the article on potting soils which lists recipes from several members. Collecting wild plants is generally discouraged -- see why! Landscaping Southwest is a program that investigates water-wise landscaping and gardening. This video looks at the La Mesa Community Garden in the first half and Ralph Peters' xeric yard and his cactus & succulent collection in the second half. It shows cacti, succulents, and other native plants (ocotillos, penstemons,...) used in landscaping and discusses their cultivation. 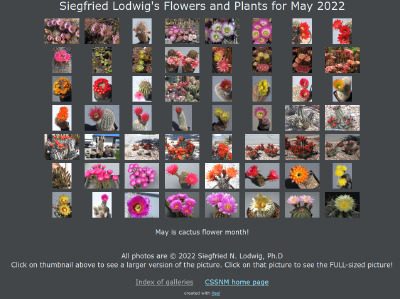 Checkout picture galleries of flowering cacti and succulents and seedlings courtesy of Siegfried Lodwig. A new gallery is up for January - March 2019 with 24 photos! Useful links for information on the web may be found here. We have a new newsletter and pictures from the Labor Day show at the ABQ Botanic Garden. The library list has been updated! Check it out as our library is large. What does the society do? Get an idea from a list of recent events.